At that moment, two other students from Sunway College’s Canadian International Matriculation Programme (CIMP) – Wee Tai May and Farhana Mohd Fadzli, both 18 years old, happened to pass by, they too stopped and offered their help. “Immediately after she told me she was in labour, I dialled for an ambulance and helped her to the floor with help from the staff members from a nearby restaurant, Capricciosa and two others, Tai May and Farhana. They fanned her and helped to keep her privacy while I prepared myself for the delivery,” said Shirley. The infant, Seow’s third child was delivered smoothly. Shirley supported the infant’s head and neck as she knows new-borns are very fragile. She described once the baby was delivered, a lot of things were going on, people were handing her towels amongst other things but her main focus was trying to make the baby cry. “We realised something was wrong when the baby was almost purple and wasn’t crying. I quickly told Shirley to pat the baby’s back until it cried. Thankfully the baby did!” said Farhana. But they were faced with the problem of the umbilical cord. Shirley and the others had considered borrowing scissors from nearby shops but were worried about hygiene and that it may lead to infection. At first, the girls resorted to using a lanyard but it didn’t work. “We were all looking for some rope or something to tie around the cord and it wasn’t until then that I saw my own shoes and handed one of the pair to the father (Kee Hoo Beng) and asked him to take the shoelaces out. He took it out right away and I tied it around the cord. Then we waited for the ambulance to arrive,” said Shirley. While waiting, Shirley and another student Wong Hui Yi from Taylor’s College tried to stop the mother’s bleeding with toilet paper. Shirley also asked the father to hold his wife’s hand and talk to her to keep her awake until the medical team arrived. Tai May, who was beside the mother the whole time, also helped to hold her hand while encouraging and talking to her so that she won’t fall asleep from exhaustion. Sunway Pyramid staff members also lent the girls and the mother a helping hand while the Security team and Auxilary Policemen helped cordon off the area. 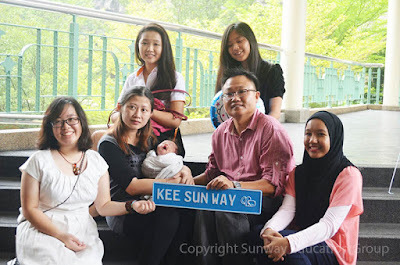 One month after the miracle incident, at the baby’s full moon party Mr and Mrs Kee Hoo Beng announced they decided to name their baby boy Kee Sun Way after the shopping mall. The girls’ extraordinary deed earned them the Star Golden Hearts award. The inaugural award was given out by the Star Media Group Berhad in December last year to Malaysians from all walks of life who have contributed heroically in assisting fellow Malaysians, regardless of race and background.